How nice to walk on his own garden atits beautiful paths, admire the beds and manicured flower beds, and then eat rosy apple directly from the branch. But to all this splendor was a lot of work. To the soil was fertile, it is necessary to make a lot of organic matter. Mulching grass - a great way to keep the soil in good condition. It can be expanded in the beds immediately after mowing or pre-punch. To the thick stems of greenery increasingly decomposed, they are recommended to pre-chop. You can make a grinder grass with his hands, or just buy it. Option # 1 - a drill to help you! Selection of finished products largely depends on thea volume of raw material to be grind. 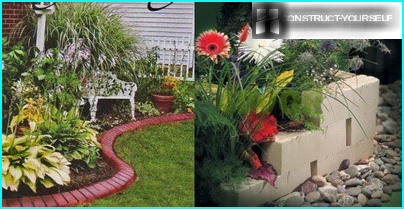 After milled Herbs not only need to fertilize the soil. 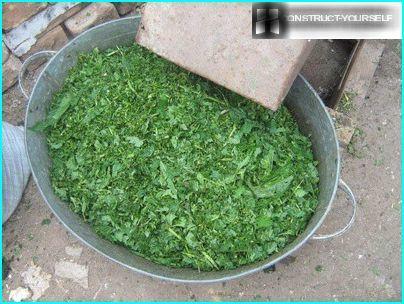 Useful it and those who have a part-time farm: chopped fresh herbs added to the feed of livestock and poultry. With a small amount of work can be easily overcome with the help of the usual chaff. 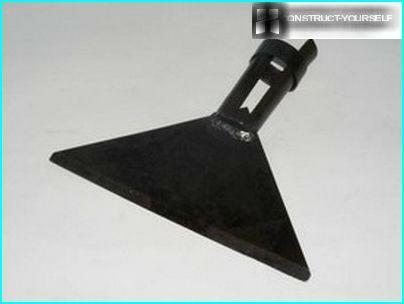 So called triangular plate provided with a strong and sharpened lower edge. For skewer chaff on a long stalk. It allows you to not bend during the work. Raw materials, which is to be chopped, it is necessary to spread on the ground layer at 10-15 cm The surface must be solid, and the layer of grass -. Not too big. Then the chaff is not blunt and will not spring back. When sliced ​​strokes from top to bottom the grass is cut into small pieces. If the volume of the processed green is large enough, you need a solid unit, which will help to choose the video. The main purpose of this article is to findways of self-production of the equipment that will be needed in the economy. If you have the desire, patience, and the minimum skills, you can make a homemade herb grinder that will work no worse, and perhaps even better than purchased. It is better, because only you know the needs of their farms and can perfectly adapt the instrument to their own needs. It will be exactly as you want! Excellent travorezku very simple to construct from the usual drill. The way it works is simple enough device, can be seen in the video posted below. Thus, the grinding process is reminiscent of the workfood processor: in the cylindrical body, whose role is played by a simple bucket is sharpened knife. By rotating it around at high speed occurs cut grass. To produce this travosechki used dual-mode drill "Temp", with a capacity of 850 watts. The knife is made of the saw blade. The secret is hidden in sharpening the knife. If it is done correctly, the grass will not be wrapped around the blade. The knife should be clean and free of greenery. Sharpen the knife unilateral sharpening. It should focus sharpened plane down. If you have to grind fresh grass, the best knife will narrow rhombus shape, the cutting edge went "out" at an angle to the edges. In an extreme case, it is possible to round the blade to the tip. Then the grass on which the centrifugal force, slides on the cutting edge of the knife directly to the edges. It cuts through it easily and never wound up on the knife. Working principle of this device is noIt differs from the previous one. Just looks like it's more civilized and performance of its higher. If in the previous case, the grass was already in the tank, which is placed a cutting tool, it is now the raw material is fed through the top hole and ready to go out through the lower substrate located on the side of the machine. To ready the silo when a rash is not scattered, to be used for the outlet of the protective cover. 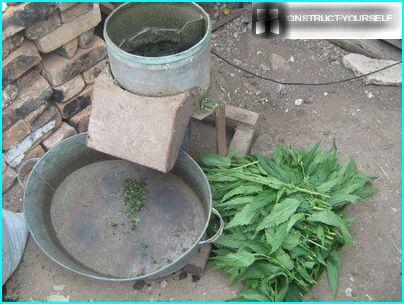 Chopped herbs collected in a bucket thatyou need to substitute a precaution outlet. It is clear that choosing the height of the racks for the unit, it should be borne in mind that conventional bucket parameters must pass freely to place it in the right place. So with the "Typhoon" is here? 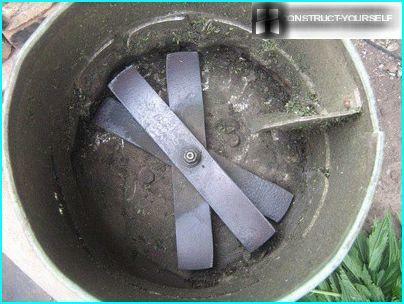 The body of the old Soviet vacuum cleaner "Typhoon" is ideal for elementary Shredders grass: it has an upper opening of the most suitable size. Once again: this is the perfect option. But not the only one! 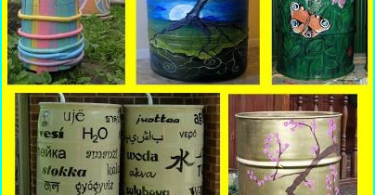 Any cylindrical container, whether it is oldpan, bucket, or tube section will also work. 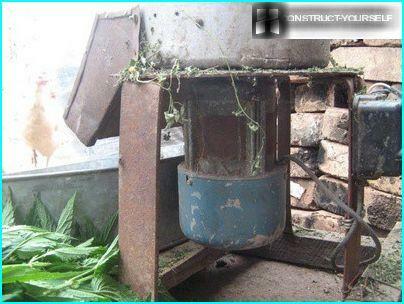 The engine power of 180 watts can borrow from an old washing machine. On the knives go old saw blade, and as the rack is recommended to use a rectangular profile 15x15 mm. Here sleeve of 40 mm in height, which will be mounted knives, have carve a lathe. The engine if the pulley is attached to the studsbottom to the container. To clamp the knife, useful water nut 32 mm in diameter. In the manufacture of bushings foresight to cut the thread under the nut. Do not forget about the hole for the motor shaft. In order to be reliable fixation to the shaft in the sleeve make two holes 7 mm in diameter are cut in the retaining thread for M8 bolt. On the motor shaft to eat through the back of the site to increase the reliability of locking sleeve retaining bolts. At a height of 15 mm in the upper part of the cylinderBulgarian lifted faces to form a square with a side of 25mm. On it will be worn and knives. To make knives, need to cut from the saw blade grinder 4 blanks. In the central portion of each blank is cut square opening 26 mm. The width of each part depends on the degree of rigidity of the parent metal. It is clear that knives should be placed closer to the bottom. Their cutting edges are sharpened using a grindstone. Bolts securing the sleeve is placed above the knives. If you can not make an outletSilage directly under the knife, it is equipped on the side. For this grinder can do a circle of 7x7. For the formation of the guide body is used tin. By shredding casing is attached M3 screws. Platform unit should be as stable. To do this, it makes the base more than the upper part. Make it to be the most functional and comfortable. The purpose of the platform is not only to keep the chopper,but also to protect the engine. Her fixed to the container 3rd bolts M 6h45. The side faces the platform better close up of tin sheets. The racks for M3 threaded bolts that sheets and fixed on the platform. Armed with the knowledge acquired as a simple and useful when reading the description of the manufacturing process of the previous unit, you will easily and effort built himself something. the cord and the plug. We invite you to view the photos carefully, because they do not require special comment. All clear. Proceed to create a herb chopper and all you get is excellent. Three previous unit was converted successfullygrass in the silo. But if we need a shredder is not only herbs, but also hay, should look more to one invention, which is represented in great detail in the video below. Any device, creation of which is described above,equipped with a sharp cutting parts. To serve you for a long time, bringing relief work, not inflicted injury, observe when working elementary safety precautions. If the operation of the unit is connected withelectricity, be doubly careful and take the necessary measures. Be especially careful to ensure that travorezku did not try to include children. It is better to overdo it than overlook!